A time for everyone in our St. Elizabeth community to join together in celebration of faith, education, and service. The theme "Learn, Serve, Lead, Succeed" encompasses the core values of Catholic Schools across the country. Keeping these values in mind, we took a break from our studies to celebrate with some fun activities as a school! To kick off the week, our upper school students and faculty went head-to-head during a game of St. E history trivia at the Monday morning assembly. With two history teachers on their side, the maroon team was victorious. Many thanks to our very own St. E historian, Mr. Kevin Scott, for providing us with these interesting and fun facts about our #VKNation! Tuesday was a day full of fun! We started off the morning showing our appreciation for all of our Viking parents by greeting them curbside with a smile and a donut! We appreciate all of the sacrifices you make to provide your children with a catholic school education. For the first time ever, our Color Wars spanned across the entire school, Pre-K3 through 12th teamed up for some colorful fun. Purple, blue, yellow, black, green, orange, red... the list goes on and on! We all packed into the St. E Center at the end of the day for our school wide Minute-to-Win-it competition! And somewhere in this crazy day we had time for even more creative expression! Our Art 1 students took the LEAD and spent the morning teaching our 4th graders about composition, balance and contrast. Together, they made original works of art! We love when our littles and bigs come together to serve the community! 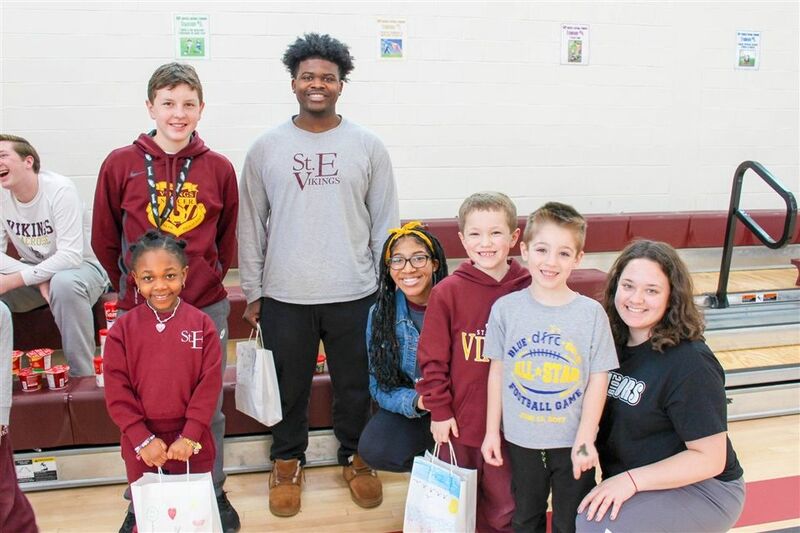 Our seniors partnered with our lower school students to decorate and create On-the-Go Meal Kits for families benefiting the Ronald McDonald House. The bags were complete with snacks and a positive message and some happy thoughts. And while that was happening, our upper school students created Cold Weather Bags and Lunch Bags for the Ministry of Caring. Despite the cold weather, we had a beautiful Catholic Schools Week Mass with Bishop Malooly. And as always, we ended the week with our upper school Pep Rally! CLICK HERE for a full recap of the week, complete with a full photo gallery. Take a glimpse into the fun, view our color wars VIDEO HERE!